This year marks the First Annual, A Night of Inspiration! Scholarship + Awards Gala for Aspire Basketball Academy. This fundraiser features a silent auction, appetizers, and live music and is attended by current parents, alums, Louisville locals, and sports enthusiasts alike. There are many opportunities to get involved, including serving on the committee, sponsoring the event, donating or procuring auction items, and, of course, attending the event. This is our largest fundraising event of the year and we hope you will participate. If you would like to get involved please contact Tim Barnett or Jamie Warfield. Click on the flyer below to purchase your tickets now! Save the date for this year’s gala! A Night of Inspiration! Scholarship + Awards Fundraiser is on Sunday, February 10th 2019 at The Majestic. Proceeds from this event go to support all of our students 9th– 12th grade and Post-Graduate. Tickets are $50 and include drinks, appetizers, dessert, dancing, and auction fun! Aspire Basketball Academy's 2019 Scholarship Fundraiser! Sunday, February 10, 2018-6:30 p.m.
Save the date for this year’s gala! A Night of Inspiration! 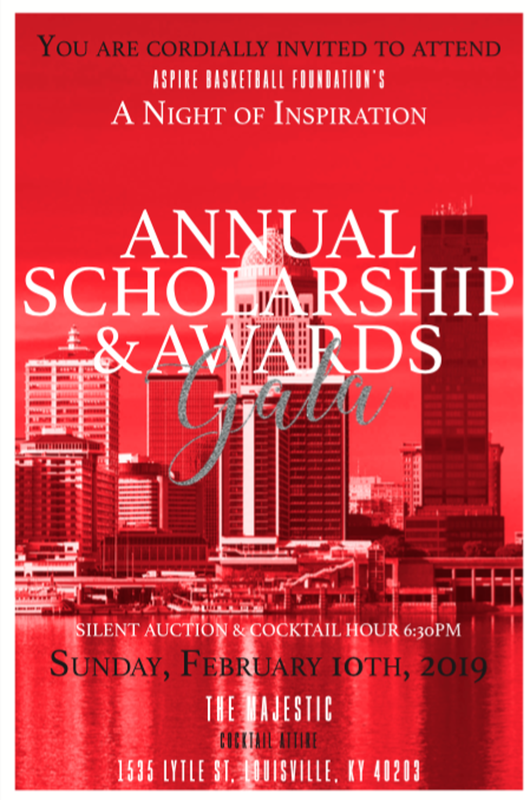 Scholarship + Awards Fundraiser is on Sunday, February 10th 2019 at The Majestic. Proceeds from this event go to support all of our students 9th– 12th grade and Post-Graduate. Join us in honoring three Louisville Natives that Inspire our Community! Tickets are $50 and include drinks, appetizers, dessert, dancing, and auction fun!